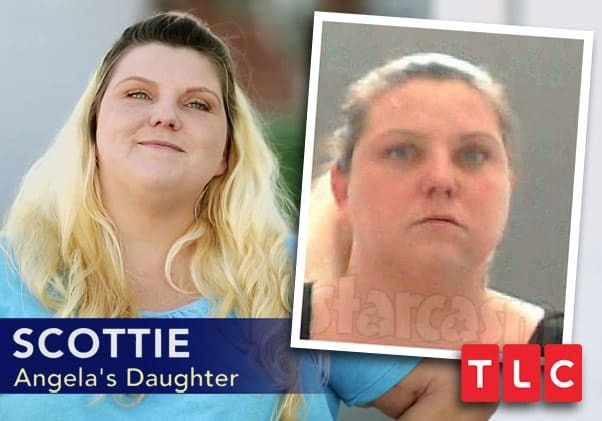 It has been an incredibly difficult 16 months for the daughter of 16 and Pregnant star Lindsey Nicholson. After being born prematurely with her twin brother Jackson at just under 30 weeks, Paisley has gone through multiple surgeries, inaccurate diagnoses, and trips to various hospitals all over Texas. 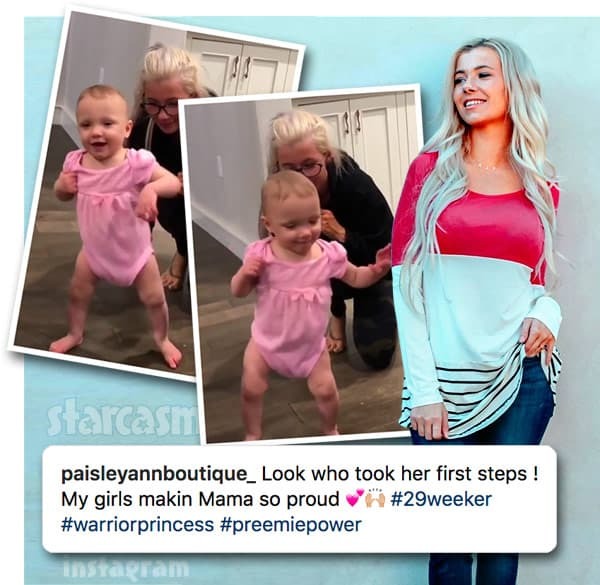 The Nicholson’s little “warrior princess” is now doing great, and Lindsey just posted a video of her taking her very first steps! “Look who took her first steps!” Lindsey captioned the video. “My girl’s makin’ Mama so proud 💕🙌🏼” She concluded with the hash tags #29weeker, #warriorprincess and #preemiepower. And Paisley isn’t the only Nicholson doing and looking and doing great! Mama Lindsey continues to pursue her real estate career while also building the success of her online clothing boutique named after her warrior princess. Got that ☀️ in my pocket. Today’s forecast: Lazy with a 90% chance of Netflix . Getting back to Paisley, I couldn’t be more thrilled to see that she and her brother Jackson are healthy and happy! We’ve followed their story closely — especially Paisley’s — since they day they arrived, and it was an incredibly emotional roller coaster ride. I really cannot imagine what the experience was like for Lindsey, her husband TJ, and their daughter Aniyah. 16 & Pregnant Season 4 alum Lindsey (Harrison) Nicholson has revealed that she’s expecting twins. Lindsey, whose arrival of daughter Aniyah was documented on 16 & P, announced earlier this month that she was expecting. She and husband TJ, who has legally adopted Aniyah, were obviously excited about the good news. Lindsey Nicholson is asking for prayers for her unborn twins as she enters the hospital while just over 24 weeks pregnant. Lindsey Nicholson has been having complications with her current pregnancy, and those complications have now resulted in her being hospitalized until her twins arrive. October 16, 2017 – Lindsey Nicholson pregnancy update: still in the hospital, but 28 weeks & counting! The last time we checked in with 16 and Pregnant alum Lindsey Nicholson, she was 26 weeks pregnant, in the hospital, and being placed on bed rest until her twins arrived — which was hopefully later rather than sooner. Keep reading for the latest update, which is all great news! The suspense is over! 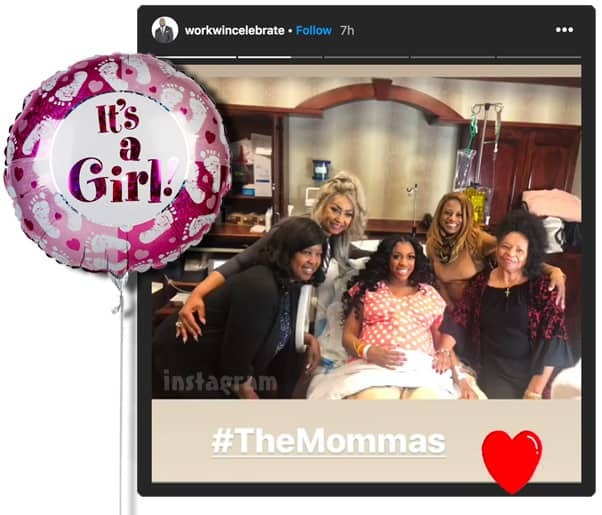 Lindsey Nicholson has given birth to her twins after a very risky pregnancy that saw her hospitalized and placed on bed rest for the past month. Keep reading to see the first photos of little Paisley and Jackson and get an update from Lil Mama Lindsey! Lindsey Nicholson gave birth to twins last week after a very difficult pregnancy, and, although her little boy and girl arrived early, it appeared as though the major health risks had been avoided thanks to the extra few weeks in the womb. 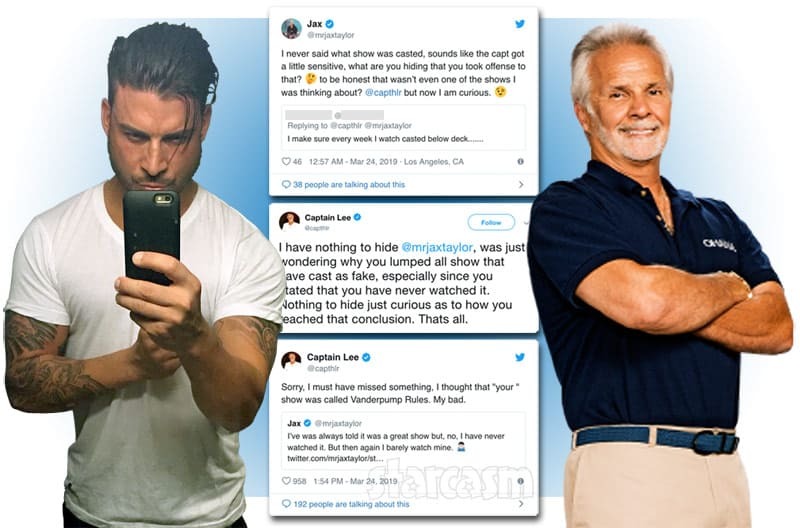 But Lindsey revealed this weekend that her daughter Paisley has been diagnosed with a staph infection, and she asked her followers for prayers as doctors prepare to test Paisley for meningitis. Lindsey Nicholson continues to update on the health of her twins Paisley and Jackson, which she gave birth to while just under 30 weeks pregnant on October 25 after a very difficult pregnancy. In her most recent post, Lindsey reveals that Paisley has been treated with an antibiotic not used on a baby before, and things are looking up! 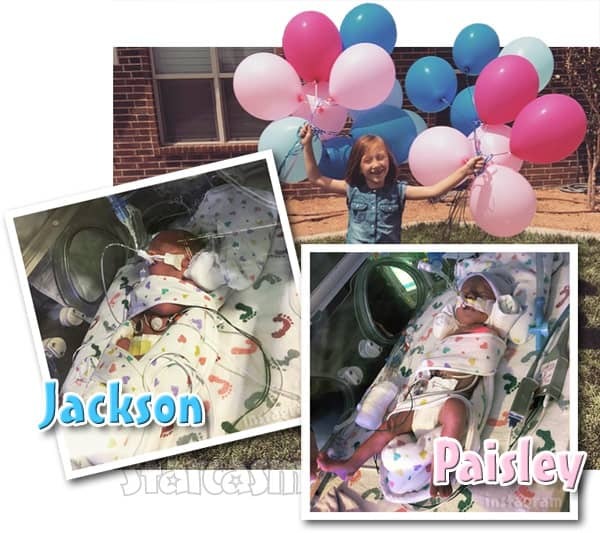 Lindsey Nicholson continues to update fans on the health of her premature twins Jackson and Paisley, both of which have spent time in NICU with serious medical issues since their birth on October 25. Lindsey Nicholson flew to Houston with her premature newborn twin daughter Paisley on Wednesday after doctors diagnosed Paisley with Bilary Artesia, a very rare liver disease that requires immediate surgery. Lindsey was forced to leave her other premature twin, son Jackson, in a Lubbock hospital so she could be with Paisley when she undergoes the procedure in Houston. Get all the latest from Lindsey and find out how you can help her family deal with the rising medical costs by contributing to a GoFundMe campaign set up for them. Get all the latest on the health of 16 and Pregnant star Lindsey Nicholson’s premature twins Jackson and Paisley. The last time we checked in earlier this month, Lindsey and her husband TJ were forced to leave their son Jackson in NICU in Lubbock to fly with Paisley to see a specialist in Houston as they tried to determine exactly what rare liver disease she is suffering from. 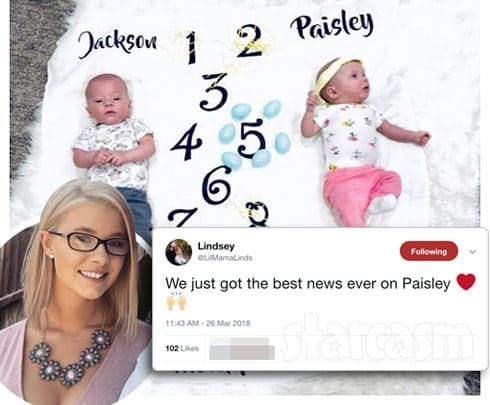 Lindsey Nicholson continues to update fans on the health of her premature twins Paisley and Jackson, and earlier today she shared some GREAT news! Lindsey Nicholson’s twin daughter Paisley continues to have health issues after being born more than two months early in late October. It appeared as though things had taken a huge turn for the better the last time we checked in, and soon after that, Paisley was even able to go home for the first time. But, some recent test results were not good, and Lindsey has left Lubbock once again to fly back to Houston with Paisley for more tests and a potential transplant. Lindsey Nicholson‘s infant daughter Paisley continues to have serious medical issues, and the Nicholson family is now in Dallas for more tests in hopes of finding out why Paisley’s liver is still failing. Lindsey Nicholson‘s twin daughter Paisley continues being a little warrior as doctors are still trying to figure out the cause of the five-month-old’s liver problems that have plagued her since her premature birth in late October. In the latest update, big warrior Lindsey shares some good and bad news from the latest round of tests as Paisley preps for surgery on Friday. Sunday was exactly five months since former 16 and Pregnant star Lindsey Nicholson gave birth to her twins Jackson and Paisley — and after five months of multiple surgeries, inaccurate diagnoses, and trips to various hospitals in Texas, the Nicholson family finally got some GREAT news in regards to Paisley’s health. Meet 16 and Pregnant’s Ashley Salazar in person… and win a cheetah print coat!